#1) Panama’s Coiba Island National Marine Park is home to some of the world’s most explosive inshore fishing action. Aggressive predatory species such as Cubera Snapper, Roosterfish, Cobalt Trevally, Jack Crevalle, and Snook readily attack top water and shallow running plugs cast along the many sandy beaches and rocky coastlines. Fishing live baits in combination with this top water technique is also deadly in attracting arm-wrenching strikes. #2) World class offshore action is often to be enjoyed when fishing legendary Hannibal Bank and Montuosa Island. Monster Black and Blue Marlin, schools of Wahoo and giant Yellowfin Tuna, plus huge Pacific Sailfish and Durado congregate to feast in these bait-rich waters. Panama is the Northern hemisphere's number one fishing location to pursue large Black Marlin. Most of these fish weigh from 300 to 500 pounds, but larger fish weighing up to and over 1,000 pounds have been caught from our boats. These same waters are also one of the Eastern Pacific’s top angling destinations for giant Yellowfin Tuna — 40 to 300 lbs. and more. At Pesca Panama, we specialize in catching Yellowfin Tuna on poppers. Larger Pacific Sailfish exceeding 100 pounds and big Dorado may be taken on light tackle. The month of December is by far the best time of the year to experience spectacular Dorado fishing. For fast action, try trolling for Wahoo. From May through November, multiple hook-ups are common as these toothy speedsters aggressively attack our lures. Starting off the day with a hearty breakfast you will join your captain and fishing mates for a full day of fishing for multiple species which will be arranged and targeted for that day, lunch will be packed for the boat. Anglers fish two, three or four per boat. Return for diner and overnight. Plus international airfare to David. Airport departure tax, bar tab, domestic airfare/international airfare, (apr. $300.00 per person for domestic), meals in Panama City, room taxes, tips, gifts or items of a personal nature. 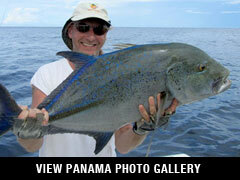 Pesca Panama offers year-round fishing. You'll fly internationally into Panama City, Panama. Overnight in Panama City, you'll then fly by charter plane to David City, where the your captain will meet you and transport you by boat alongside the Pacific coastline (while fishing) to the lodge. Our guests stay aboard our floating lodge. This provides our anglers with a clean and comfortable base camp, with close and easy access to Hannibal Bank and the many islands in the Coiba Island National Marine Park. The mobility of the lodge allows you to travel to remote tropical settings where the fishing begins right at your front door. Newly renovated, the lodge can accommodate up to 16 guests. With four beds each, the four air-conditioned cabins share two clean bathrooms with hot-water showers and plenty of fresh water. Also to be enjoyed is a very comfortable, air-conditioned salon, as well as an on-the-water dining area along the front of the lodge, complete with a friendly cash bar. Delicious Panamanian/American cuisine is prepared daily by our chef. Featured is the “catch of the day” served with fresh vegetables and tempting homemade desserts. DAY 1: USA-Panama City (Saturday). Overnight Hotel Panama or Veneto Hotel and Casino. DAY 2: Panama City-Pesca Panama (Sunday). Transfer by charter plane from domestic airport to David early morning. Boat transfer to lodge with afternoon fishing. Overnight. DAYS 3-6: Full days fishing for roosterfish, wahoo, marlin, sailfish and over 30 other game fish species. Overnight at Pesca Panama Lodge. Day 7: Fish half day in the morning on way back to David to Panama City. Transfer to hotel for overnight. No shots are required to enter Panama, no bug repellent is needed. Be sure to bring sunscreen. Bring dramamine if you are prone to sea sickness. Pepto-Bismol or Immodium may help incidental traveler's diarrhea. Note: Health precautions are offered here as an informational service only. See your doctor or health clinic. Daytime temperatures typically range from 80-100 during the day, but typically cool down to the 70s in the evening. Heavy tropical downpours can occur even during the "dry season" so be sure to pack a rain jacket. Humidity in the tropics can play havoc with cameras or other electronic devices.